The eighth grade language arts curriculum blends reading, writing, discussion, and creative projects. Each student learns the importance of close reading, analysis, and interpretation. In writing, students focus on drafting and revising as they refine their writing of thesis statements, body paragraphs with evidence, and conclusions. Students advance their analytical skills by identifying how word choice and structure affect the audience of a text while also tracking themes and motifs in literature during classroom discussions. The class will read classic novels such as To Kill a Mockingbird and Whirligig, as well as Shakespeare’s Othello. Students will also read two novels to pair with each of their social studies units. They will read Warriors Don’t Cry by Melba Patillo Beals during their unit on the Civil Rights Movement and Night by Elie Wiesel during their unit in World War II and the Holocaust. In eighth grade science, the major topics of study are chemistry and genetics. Students start the year by learning about scientific notation and density. Students then study atoms and examine atomic models devised by famous scientists. Students explore the organization of the Periodic Table and use their knowledge to determine the properties of elements. They later study the different types of bonds in molecules and compounds, as well as their structural formulas and balance equations. During the unit on acids and bases, students complete a series of labs, including an antacid titration and measuring the pH strength of various substances using pH indicators. Students utilize TinkerCad and BlocksCAD to design a 3D printed model of a compound or molecule that they research. Near the end of the year, students are introduced to the field of genetics. They use Punnett squares to predict genotypes and phenotypes. Eighth grade social studies uses the Facing History and Ourselves curriculum to discuss the Civil Rights movement in the South during the 1950’s as well as the Holocaust. A variety of assessments such as creative writing assignments, analysis of primary sources and project based learning are used to determine student comprehension and progress. Students also read novels that are connected to the social studies units to deepen their appreciation for the historical time period. The first half of the year focuses on racial inequality in the South, primarily on school integration in Little Rock, Arkansas. Students read first hand accounts from people who were involved in these events as well as the novel Warriors Don’t Cry, by Melba Patillo Beals. The second half of the year is centered around World War II and The Holocaust. Students analyze the factors that led to Hitler’s rise to power and the tactics used to gain support in Europe. Students in eighth grade Hebrew continue to improve fluency in speaking, writing, and reading. The focus is on using present, past and future tenses seamlessly while also learning advanced grammatical structures and idioms. Major emphasis is on spoken fluency. Students read a full-length novel in class to expand vocabulary and experience Israeli literature. Students analyze and describe major events, themes, and concepts in Hebrew. Students are introduced to modern biblical commentators and their interpretations and style. Students also study and learn about the Torah service along with discussing the weekly Torah portion. In eighth grade Jewish studies, students deepen their understanding of Jewish holidays and their historical, natural/agricultural, and faith-based foundation. They learn how our customs and traditions enrich and strengthen them as individuals within our Jewish community. Prayers and blessings related to the holidays are recited and Hebrew stories connected to the Jewish holidays are studied. 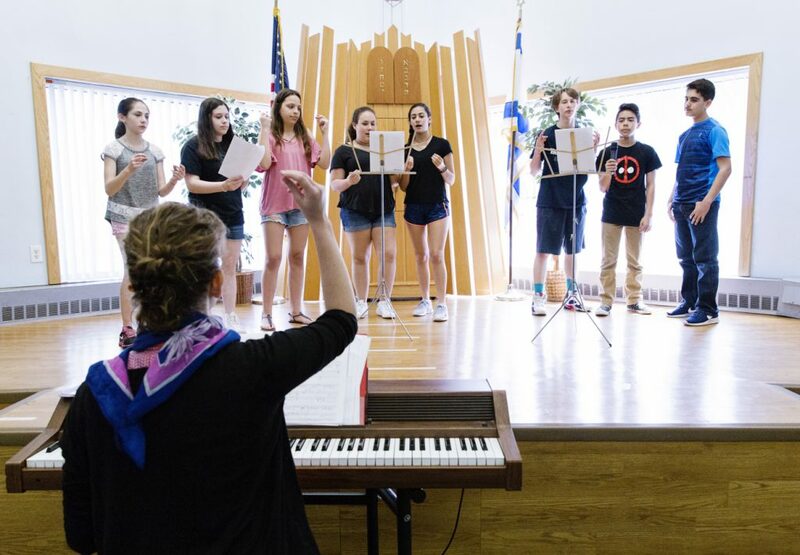 Students in eighth grade focus on the rise of modern Israel since the establishment of the country in 1948. They explore major events, culture, peoplehood, military history, and day-to-day life as well as current events. Eighth grade is the culmination of all the theater, debate, and speaking skills that students have been learning throughout their time at EHS. Students will be able to demonstrate their speaking skills during a debate showcase, including projection, diction, and body language. Students will also have the opportunity to perform a variety of individual and group scenes, written and improvised, using props and costumes that they have built and/or designed. Students will continue their character work studies, using Shakespeare and scenes that they’ve created. At the end of the year, eighth graders will be able to collaborate on the spring musical and act as leaders for their peers during the rehearsal process. The final performance will showcase all of the 8th graders’ acting and public speaking skills that they have been practicing during the year. Students in physical education classes are encouraged to participate in sports education, teamwork, physical fitness activities and in game strategy in class. In addition to gross and fine motor coordination, stretching and agility middle school students are taught age appropriate sports skills and team communication through drills as well as game-like scenarios. Units include soccer, flag football, team strategy games, floor hockey, ultimate frisbee, individual problem solving games and basketball. Social team building and sportsmanship skills are woven into game like scenarios to teach students not only the skills to play multiple sports but the interpersonal skills to function in a fast paced team environment.